If you upgraded to the 5.5 version of our Android, iPhone and iPad news apps, you will notice we updated and streamlined the weather alerts. 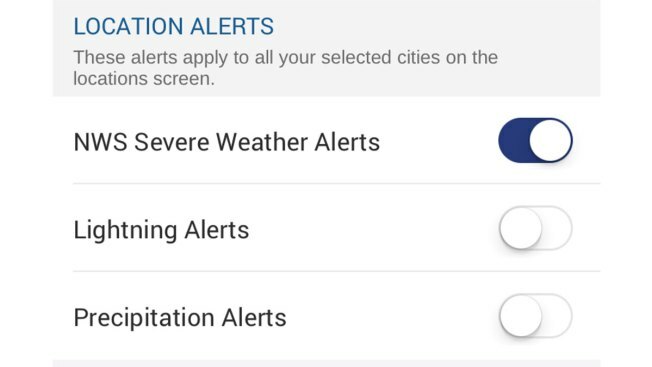 You can choose to receive alerts from our station’s meteorologists, get severe weather alerts from the National Weather Service and sign up for lightning and precipitation alerts for up to 25 locations. If you’ve been using our app and then downloaded the 5.5 version, the weather location alerts you had picked did not transfer to the new app version. We know this might be inconvenient but choosing locations alerts is easy to do. To set up the alerts, just tap on the app logo in the top left corner then tap on Weather Forecast. Tap the plus sign next to the location under the radar. This will allow you to add or delete locations (you cannot delete the Default location or the Current Location). To control the alert settings for the cities, click the three dots next to the city. You can set it as your location and enable or disable alerts for it. You can also remove the city from your list. Under the city name it’ll tell you if the alerts are on or off. Station Alerts — Important updates from our station’s meteorologists, including the daily forecast information. NWS Severe Weather Alerts — Notifications from the National Weather Service about watches and warnings for severe weather like thunderstorms, tornadoes, snow and more. Lighting Alerts — Alerts that are triggered when lightning has been detected in your area. Precipitation Alerts — Alerts about rain, snow and hail approaching your location. After you change the settings, it’s best to close your app and then reopen it to ensure the app saved your settings. You can customize the start screen of our app to highlight news or weather when you open it. If weather information is crucial for you and your family, we want you to see it immediately on the app to make your life easier. If you’re more interested in local and national news, you can continue to see that first when the app opens if you want. To make a change, tap the app logo in the top left corner, and tap "Set Your Start Screen." You will see a preview of how the app will look with Top Stories or Weather as the start screen. You can also change the start screen by tapping the gear icon in the upper right corner and choosing between Top Stories and Weather.